This is, obviously, the second part of a double album, even if the main titles differ slightly from each other. 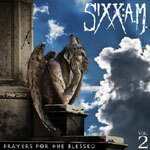 The first one, Prayers For The Damned Vol. 1 came out about 7 months ago and I became rather amazed by how they had bounced back from the worst album they have ever put out, Modern Vintage. With Vol. 2 I can't find the nice flow that Vol. 1 had and I think that the first one indeed has stronger songs overall and definitely the absolute highest peaks too. The overall direction and sound of the albums is basically similar of course since everything was recorded at the same time, so it just comes down to which song is on which album, really, and in my book the greatest stuff for the most part has unquestionably ended up on the previous album. Even if the ballad Riot In My Head is pretty okay, the lighter songs Maybe It's Time, Suffocate and Helicopters don't go down nearly as good as for instance the title track of the first Prayers record did. I also give my strong disapproval when they've decided to make a cover version of the pop song ballad Without You, originally recorded by Badfinger in 1970 and re-worked by countless of artists since it first was out. It really gives me the creeps and it just feels so pretentious to choose a song like that. Vol. 2 is utterly a very uneven record. It comprises a few really good tracks, but it certainly has its deep pits and valleys too. It would definitely have been a wiser choice to strip down this double album thing to about 10 or 11 songs instead, because then the Prayers part of their career would have turned out eminent and not just something that will have one foot on a pedestal and one foot struggling just above the surface.